Storage has been an ever changing and evolving center of innovation propelled in part by the infrastructure changes VMware and cloud computing drove into the data center. This week at VMworld 2014, VMware showcased Virtual SAN (VSAN) and Virtual Volumes (VVols), two areas of storage innovation. VSAN provides the storage element within the new EVO hyper-converged infrastructure platform and VVols provide policy based ‘VM-granular’ storage capabilities with storage arrays. VVols represent a significant advancement in data management and infrastructure scaling. By exposing the native data management capabilities of the underlying storage arrays to VMs via a set of standardized set of APIs, Vmware is actually unifying the various tools, application and processes which have developed over the last decade in an attempt to manage the disconnect between application, storage and data management. ‘VM-granular’ storage is a gross understatement to the potential provided by VVols. VVols is a departure from the shared storage pool model where virtual disks are files stored on VMware’s clustered file system VMFS or open distributed file system NFS. While VVols supports the same SAN and NAS protocols in use with shared storage pools, it differs as data is written directly to storage volumes on the array. This model is very similar to the storage architecture of a physical server connect to a SAN. While guest connected storage options have existed via raw device mappings (RDMs), SCSI ID limitations and lack of partner integrations have limited this model to edge use cases. Note: VVols over NFS will still leverage a form of file-based storage replacing today’s virtual disk files with virtual volume files. Storage vendors leverage their VASA provider that acts as a translation layer between their proprietary commands and the VVols APIs. Through VASA VMs map directly to array-based volumes and VMware administrators can leverage the VVol management framework for standardized and vendor-unique functionalities. Let’s take a look at a few of these capabilities and their impact. VM provisioning (array clones): The initial release of VVols offloads the provisioning of VMs from templates to the storage array. While similar capabilities have existed since 2006 with NFS and later in 2010 with VAAI for VMFS deployments; provisioning VVols will be markedly faster than the current capabilities as VVols eliminate the overhead in xcopy operations (due to the coordination between VMFS and the underlying array) or the intra-datastore cloning boundaries observed with NFS. In addition, VVols should eliminate the time differentials observed when cloning various virtual disk formats (thin, thick and eager-zeroed thick VMDKs). VMs will be either thick or thin, which with all-flash arrays are always thin on the array. Snapshot backups, application and operational recovery: VVols is a departure from the native software-based, SCSI journaling snapshot mechanism found in vSphere in favor of higher performing and significantly greater space efficient array-based snapshots. Like cloning, array-based snapshots have been available in diverse forms for years; however even today’s best implementations are riddled with limitations that lead to considerable deployment considerations. With VVols storage vendors can implement their snapshots along with their data replication and archival capabilities. This advancement is an architectural unification that greatly simplifies the data protection mechanisms for data centers wherein backing up and protecting VMs will become very similar to that of physical servers. Imagine the simplicity and synergy of native vCenter snapshots that integrate with the management interfaces and operational tools of the storage and backup teams. With array-based local and remote snapshots and VVols one can provide local snapshot restore points, disk-to-disk replication for use as off-site backup and disaster recovery, which includes end-to-end data encryption and bandwidth acceleration via data reduction, that can be integrated into backup vendors interfaces for a more robust suite of data protection services including restore catalogs, archival to tape, meeting compliance requirements, etc. These capabilities vary from vendor to vendor so speak to yours or those you are considering for greater details. I’m thrilled with the opportunity VVols provides VMware deployments. 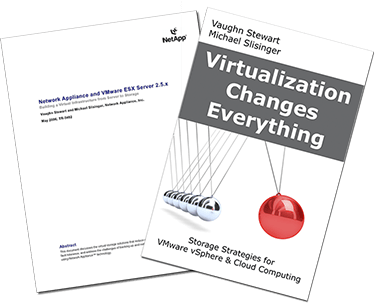 I’ve been an advocate for directly mapping storage volumes to VMs since 2006 (in ESX 2.5 Storage Best Practices – NetApp TR-3284) and as recently as 2012 (in my book Virtualization Changes Everything). I should add an interesting tid-bit – VVols introduces some significant differences in SAN & NAS storage protocols based on their inherent capabilities. Note this not the debate of lore, which focused on management interfaces. I guess this is the content of my next post along with publishing the Pure Storage VVols demo video from Vmworld 2014. The engineering teams at VMware deserve a lot of credit for solving the iSCSI device ID limit and providing a management framework to support the varied set of capabilities and proprietary manageability APIs of their storage partners. Kudos VMware, VVols has the potential to unify data management across the data center – this is truly a significant advancement. I can’t wait for the GA release sometime in 2015. Vaughn, I wasn’t able to make it to VMworld this year (the first one I missed since 2007). I am looking forward to viewing the Pure Storage VVols demo video. I am doing a PoC on a FA-420 now and am about to test snapshot replication to an FA-405 at our DR site. I am looking forward to the impact that VVols could have on replication (I want to replicate VM’s, not LUNs, without the cost of Zerto or Recoverpoint for VM’s).